The best colleges for adults returning to school are part of a sea change in the workforce and in higher education. Competition on the job market only increases each year, and workers who only have a high school diploma are at a disadvantage. The median earnings of workers with a bachelor’s degree is 67% higher on average than those with a high school diploma. According to the Bureau of Labor Statistics, the average American man will have 12.1 jobs between 18 and 50, and women will have 11.6. That’s a lot of job changes – and that was for Baby Boomers, who had a much more stable job market than today’s Generation X and Millennial workers. Today, at least 4% of the workforce changes to a completely new occupation every year – not just a promotion or lateral move, but a new career. But how do workers find the best degrees for adults returning to college, such as accelerated degree programs for working adults and fast track associate’s degree online programs? Many have the misconception that going back to college as an adult is harder. In reality, working adults bring the benefit of being focused on a goal; they know why they’re in school, and what they want to learn, unlike many young freshmen. Working adults don’t have much time so they tend to use it well to make sure their assignments are done timely. Working adults have experience in the job world and can bring that experience to their coursework. In addition, the coursework will be specific to current employment or a new job, but it will all be related in some way. The program options are almost endless since there are so many degree options available today. Many degrees can done completely online which adds flexibility for a working adult. There are many benefits of online learning for adults. Working adults have to balance many things from work to family and even social activities and an online degree always them to fit classes into their schedule when it’s most convenient for them. With online degrees, students can study from anywhere at any time without the hassle of commuting to class. Online degree programs are often less expensive than traditional degree programs because there are no commuting costs, book fees, or room and board fees. And online courses allow you to keep your job while you get your degree. The best online college for working adults is one that provides accelerated degree programs for working adults. Working adults can earn a degree in half the time with accelerated online courses. Some colleges allows students to begin a new online course as soon as they finish the previous one, without having to wait for the beginning of a new semester. There are wide variety of online courses from which working adults can choose, the degree they want is easily attainable. The best online college for working adults will also be one that allows you to earn credit for your work experience. Colleges are happy to attract working adults, who know what they want and know what it is worth, so many have established plans to accept work experience for college credit. The best colleges for adults returning to school take your experience seriously. 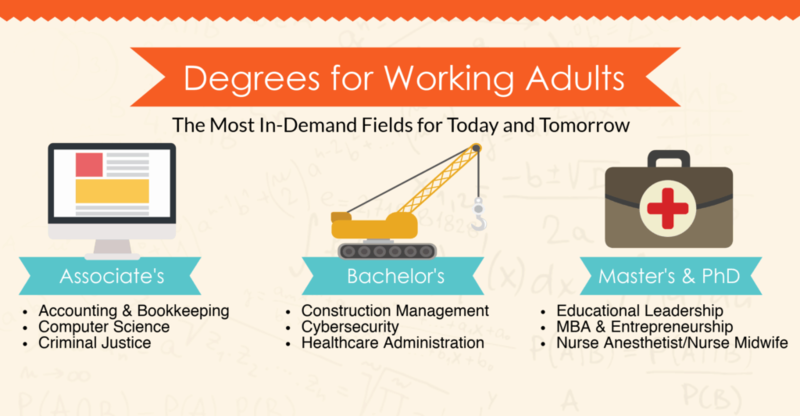 What are the Best Degrees for Career-Changing Adults? Some of the best degrees for adults returning to college are in the business field. Business administration, which gives students a foundation to gain employment in various settings such as finance and accounting. Students understand the benefits of management, leadership, and communication skills. A business management degree is great for anyone looking to move into business. This degree prepares students for entry level management and gives an understanding of business law. Medical secretary, or medical insurance billing degrees provide students the opportunity to work from home or in an office. They are in charge of reviewing and understanding claims forms. Medical billers ensure the correct codes are assigned on the forms. Working adults could get a fast track associates degree online for this career path. Accounting and finance are excellent choices for someone who has already been in a career and who has an understanding of how money works. Some of the most in-demand areas include market research analyst and accountant or auditor as top jobs for adults interested in a career change. For those that enjoy working with computers, hardware and software, a fast track associates degree online in information technology is the perfect start. If you’ve been working in a trade, adding computer skills to your skilled trade can be critical – learning electrical engineering for an electrician, for instance, can add authority and new abilities to the skills you’ve learned in apprenticeship and on the job. 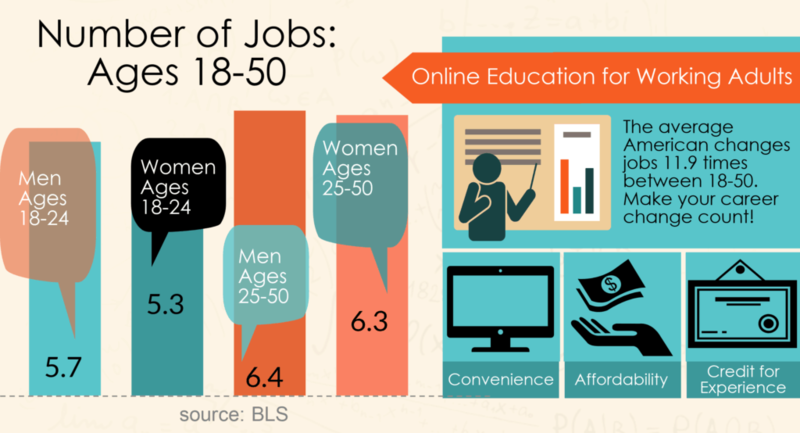 There are many benefits of online learning for adults. Adults are able to decide what’s most important and focus on their goals. Online coursework allows them to work around their life schedule and plan a study schedule that works best for them. An online associate degree is the perfect stepping stone for adult students. In general, an associate degree require 60 credits, and can be completed in half the time it takes to receive a bachelor’s degree. This allows the working adult to move quickly into a new position or career path and continue working towards a bachelor’s degree. Some fast track associate’s degree online program a student should consider are an Associate of Science in Accounting, an Associate of Science in Business Administration, or an Associate of Science in Criminal Justice. The National Center for Education Statistics is an excellent source to verify the credentials of any college. A student shouldn’t trust what the school states, a student should always verify. The best colleges for adults returning to school is one that will work with the student in terms of scheduling and even financial aid and other resources. When working adults are looking at their degree options, they should consider a bachelor online degree. There are accelerated bachelors degree programs for adults online, the fastest online degree completion programs out there. That means a working adult could get a bachelor degree in 12 months, which is much faster than a traditional bachelor degree program. Many colleges accept older college credits and transfer them towards a new degree, which is one way colleges provide accelerated degree programs for working adults. If enough credits are accepted, a students could acquire 6 month bachelor degrees. However, if a getting a bachelor degree in 12 months (much less 6 month bachelor degrees) sounds like a little too much, there are plenty of online programs that still make learning convenient for working adults, part time or full time. The fastest online degree completion programs might be too fast for your life, but you don’t have to get a bachelor degree in 12 months to benefit from the flexibility of online degrees. Business Administration – A BBA teaches students to enhance their project management, critical thinking, and leadership skills. If you have experience in trades or construction, a construction management degree can help you take the skills you already have, and add further expertise in business and leadership. Health Care Administration – A bachelor’s in health care administration readies students for many health care jobs by giving them an understanding of the basics of the laws and policies governing health care and how they impact patient care. For workers who began as a medical secretary straight out of high school, for instance, a health care administration degree can help you start moving up the ladder at a hospital. Most working adults consider master degrees because they want to enhance their current position, or to get a promotion. Master’s programs are challenging, even the fastest online degree completion programs are still competitive. Online master’s programs offer working adults the flexibility that they need most. Typically, once a student has signed up for the program, he is given the assignments, lectures, and syllabus and is expected to complete everything by the end date. The best online college for working adults is the one that offers a wide range of master degree programs. Some professions, like teaching, psychology, engineering, and social work, require a master’s degree to receive promotions and higher pay. Some master’s degree to consider are an Online Master of Science (MSc) Degree in in-demand STEM fields. Some of these degrees are in computer science, engineering, economics, and finance. There is an Online Master of Arts (MA) Degree which focuses on arts and humanities. Some of these degrees are in visual arts, political science, sociology, and psychology. Working adults considering a PhD program should consider online options. Online options allows the working adult to create a coursework schedule that works best. An online PhD could propel a working adult into a higher salary, or provide mobility within his or her current job. According to the Society for Human Resources Management, 79 percent of organizations said they had hired an applicant with an online degree in the previous 12 months. The best degrees for adults returning to college that offer a PhD program are PhD in Criminal Justice and a PhD in Education. The PhD in Criminal Justice helps students to gain a deeper understanding of areas such as global leadership, law and public policy, and emergency management. Students with this degree can explore employment as a professor, police captain, research consultant, and criminal investigator. The PhD in Education or an EdD enables students to gain a deeper understanding of areas such as early childhood leadership and advocacy, educational technology and design, reading, literacy, assessment, and evaluation. Students with this degree can explore employment in areas such as a university professor, curriculum specialist, educational consultant, or a training and development specialist. Are There Free Online Courses for Career-Changing Adults? Yes, there are free online courses available to career changing adults. Massive open online courses (MOOC) are a common model for delivering learning content online to any person who wants to take a course, with no limit on attendance. MOOC are typically free and usually are offered by reputable colleges. These are classes and not full degree programs, and for the most part they do not carry college credit – they cannot be transferred to a degree program, in other words. However, these classes are specialized and can help working adults learn new skills and approaches that they can apply to their current job. Most MOOCs take the form of pre recorded lectures that the student can watch at any time. Often they include additional material for review, quizzes and exams, and essays. Some MOOCs will give students access to message boards or chats as well, so students can interact with other students and the instructor like in a real class. Essentially, a MOOC is like auditing a class at an on-campus college – all of the knowledge, but not the credential. There are many resources available to working adults that want to go back to school. The Department of Education has an entire website dedicated to grants, scholarships and aid that’s available to an adult student. There are no age restrictions for receiving federal aid. Nontraditional colleges that have online programs are eligible for financial aid and federal loans. Federal loans have lower interest rates and better repayment plans than other loans. There are many scholarships, which is free money, available for older students. Working adults who come from an underrepresented or minority background should also look into scholarship programs created especially for them. Many organizations have developed scholarships to encourage older people of color to return to school, start professional careers, and start their own businesses, services, and practices. Working adults considering going back to school should consider an online degree. There are accelerated bachelors degree programs for adults as well as associates, masters and PhD degrees available online. Adults should look for an online degree program that meets their needs and is flexible enough to work within the students schedule. They should also be sure that whatever degree program they choose, it’s from an accredited school. Adults shouldn’t let the worry of cost stand in their way because there are many scholarships available to working adult students. If there isn’t a viable scholarship, there are always federal loans.